My wife and I almost always end up taking week long vacations in order to get the most bang for our vacation buck. However, a couple of weekends ago we were able to take a quick 3 day 2 night getaway very cheaply, including a free 2 night stay in a beach front resort hotel. In fact, you could say the whole entire trip was free, depending on how you want to classify some expenses. How much did it cost? How did we make it happen? How can you do the same thing? I’ll explain everything! The stay at our resort for Saturday and Sunday night was 100% completely free. We stayed at the Holiday Inn Resort at Pensacola Beach which was amazing. While we just booked a standard King bed room, we were upgraded at check in to a beachfront balcony King bed hotel room which was a great start to our vacation. They even let us check in a couple hours early! While the hotel wasn’t 100% perfect (more on that later), it was an awesome place to stay for free for two nights. The balcony overlooked a resort style pool that had a mini lazy river, multiple waterfalls and a huge walk in entry in the main pool area. The property had an awesome Tiki style bar, an on-site restaurant, hammocks, pool chairs and umbrellas surrounding the pool. They also had a ton of activities going on for kids that included pirate activities, mermaids swimming in the pool and an outdoor movie each weekend night. Sadly, the Gulf of Mexico was extremely rough and the red flags were flying which meant we couldn’t swim in the Gulf. We did walk on the beach a bit each day, but we mainly hung out at the amazing pool. 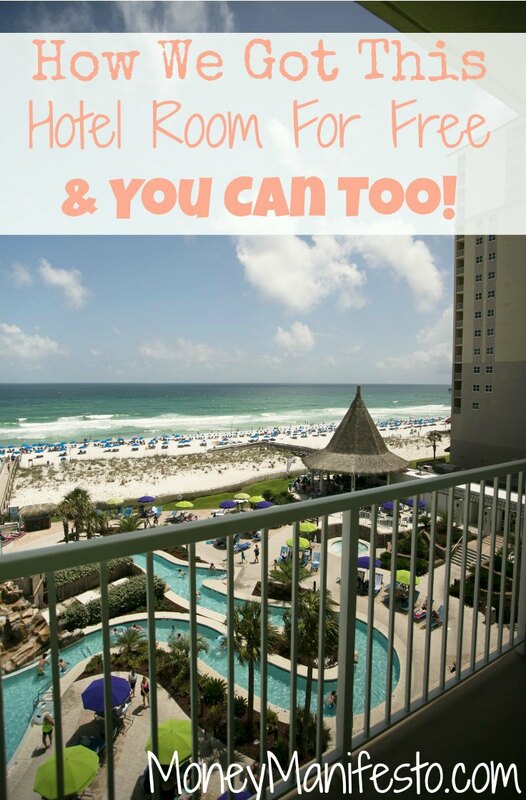 How We Got This Hotel For Free And You Can, Too! To get this hotel 100% for free, all we had to do was use 35,000 IHG points per night. 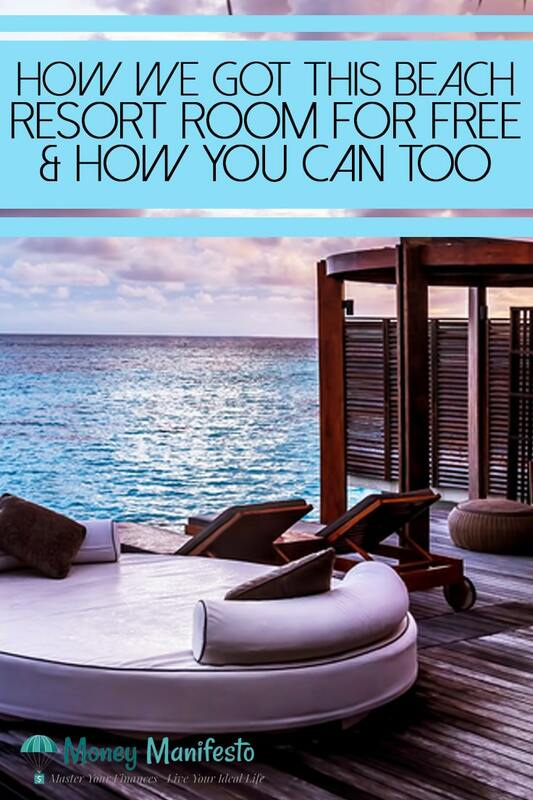 We earned 71,000 points from signing up for a credit card and spending $1,000 on it, so this was a super easy way to earn a cheap vacation. The IHG Rewards Club Select Mastercard was offering 70,000 points for spending $1,000 in 3 months when we signed up for it. We had a large purchase planned anyway so hitting the bonus spending threshold was easy. As we were checking in, I heard the front desk clerk tell a potential guest on the phone that they had one room left, a single 2 Queen Gulf Front Balcony room left and the rate was $529.95 a night. We paid $0. No taxes. No resort fees. Nothing. While in Pensacola Beach, we decided to head into town for a late lunch and early dinner at McGuire’s Irish Pub. This restaurant has been around since 1977 and we can see why. They offer a ton of amazing sounding food in a very unique location. They have around $1,800,000 in signed, one dollar bills hanging from the ceilings of the various rooms on the property. In addition, they brew they own beer and have a wine cellar that holds over 8,000 bottles. We ended up each getting one of their famous 3/4 pound burgers and took half of them back to the hotel for a second meal because they were THAT big. We also got their 18 cent bean soup. However, if you want to be cheap and only get the 18 cent bean soup, it will cost you $18! If you’re ever in the area, I highly suggest you check them out for the experience alone. Putting all of our spending on credit cards allows us to earn cash back on our every day purchases when we aren’t earning a sign up bonus on a credit card. Our personal favorite card right now is the Citi Double Cash credit card which essentially gives us 2% cash back, 1% on purchases and 1% on all payments. We can easily use this cash back to cover our meals from our trip and all other costs that weren’t covered by the free hotel room. While hanging out at the beach and the pool was fun, there were a couple other places we wanted to check out while we were in Pensacola. First, we visited the Pensacola lighthouse. While it does cost $6 per person to gain admission, it was well worth the cost. The lighthouse was built in 1859 and it still works today. 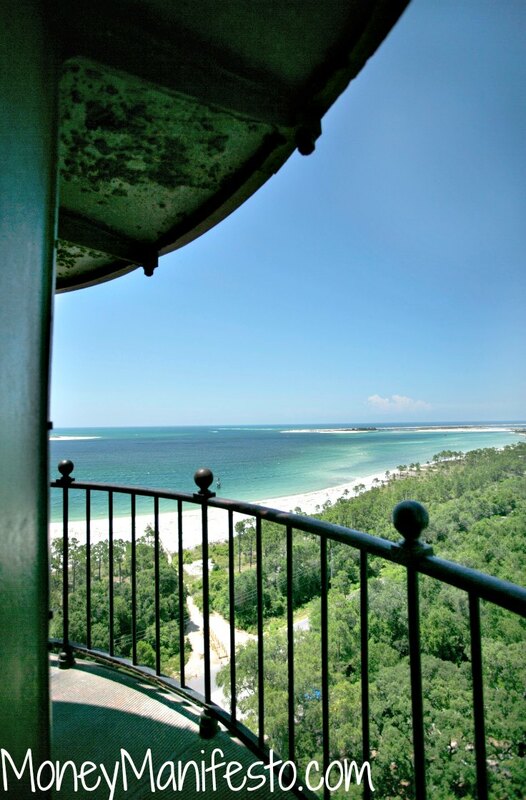 We climbed all 177 stairs to the top of the 191 foot tall lighthouse and the view at the top was well worth the climb. You can see the amazing views in the picture to the right that Tori took. You could see from Pensacola Beach all of the way to Gulf Shores, Alabama according to the employee at the top. You can even watch the Blue Angels practice from the top if you reserve a spot months in advance for a fee of $20 per person. In addition to the lighthouse, we stopped by the Naval Aviation Museum. Admission to the museum is free, but activities including IMAX movies and simulator rides do cost extra if you wish to partake. The museum offers 350,000 square feet of amazing history and actual planes ranging from tiny to gigantic. They even have some neat space stuff and multiple Blue Angel planes on display. While we spent only a couple hours in the museum, if you’re a history buff you could easily spend a couple days here absorbing all of the history and information presented. We did have a couple of small maintenance issues at the hotel, which were fixed within a reasonable amount of time but added a small bit of frustration to our vacation. The fridge in the hotel didn’t cool at all because the adjustment knob was broken which was almost a big deal as we had yummy leftovers from a meal at an awesome restaurant in town. Luckily, we were quickly brought a replacement mini-fridge which solved that problem. The other problem involved the DVD player. It simply wouldn’t work at all which was a problem as we had just rented a free Redbox DVD for the evening. Maintenance came up within an hour and simply unplugged the DVD player and plugged it back in and the DVD player worked again. I wish I had thought of that! That brings our total costs to $171.82 which was easily covered by our cash back rewards balance on various credit cards. To make things even better, we had a lot of our supplies left over when we returned for our next trip to the beach. Would you sign up for a credit card to get two free nights in a hotel like the one pictured above? Where do you like to go for your vacations? Let me know in the comments below! « Don’t Be Fooled! Watch Out For These 5 Credit Card Rewards Tricks!